Fenix Tenergy Propel CR123A 3V non-rechargeable lithium battery is one the most popular, widely used and tested CR123A lithium batteries on the market. The high capacity Tenergy Propel CR123A is designed to deliver long run times in every device that it powers whether it is an LED or incandescent flashlight, a camera, or a high tech gadget. Independent tests have shown Tenergy Propel CR123A batteries excel in higher drain devices and often outperform the 'big name' cells in those types of devices. CR123A batteries power many flashlights and optical devices from companies like Inova, Streamlight, Surefire, Fenix, and many more! Every Tenergy Propel CR123A battery incorporates PTC protection and the PTC threshold is set at 5AMPS. The protected Tenergy Propel CR123A batteries prevent excessive discharge that can damage lithium cells and may lead to catastrophic incidents. 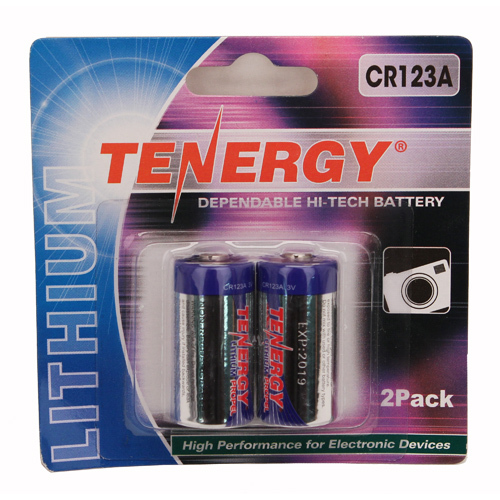 This is the world famous Tenergy Propel CR123A LITHIUM BATTERY. Offering Stunning Power Performance & Affordable Pricing the Tenergy Propel CR123A has quickly become one of the most well regarded CR123A made. Consistently rated as a Consumers Top Pick for a CR123A the Tenergy Propel CR123A has raised the bar on value and quality of CR123A Lithium Batteries. • Can be used for many applications: Photo cameras, Flashlights, light meters, and many other photo equipments. • Ultra high energy density and lasts 3-5 times longer than ordinary alkaline batteries in high current drain devices like digital cameras. • Fast Flash performance with a consistent and very short recycle time. • This highly performance CR123A can replace the following models: CR123, DL123A, K123A, EL123AP, VL123A, 5018LC, and CR17345. • UL listed and Passed UN transportation tests (T1-T8). Warning: Can Not Be Recharged!